We eat fairly light in this house. I find myself serving sides as mains more often than not. Most of our meals are “one pot” or maybe a few sides. We are not vegetarians, but come awfully close. With an athletic young man in the house I do have to consider his nutritional needs and most often plan my meals with his palate in mind. Thank goodness he has a grown up palate! Here is an exceptional side (or main) involving lacinato kale, also known as Tuscan, dinosaur or black kale. I especially enjoy lacinato kale due to it heartiness, deep dark green color and it’s ability to hold onto it’s crunchiness even after simmering for several minutes. This is a lovely combination of textures and flavors. I found this recipe in a Cooking Light magazine (thanks sis!). This is a slight adaptation and we found the recipe really only serves two. Next time I make this I will double the recipe. Cook bacon in a Dutch oven over medium-low heat until crisp. Remove from pan, crumple and set aside. Increase heat to medium. Add onions to bacon drippings in pan and sauté 3-4 minutes. Add kale and cook until kale begins to wilt, stirring occasionally. Add stock, cover and cook 4 minutes until tender, stirring occasionally. Stir in vinegar and syrup. Sprinkle with crumbled bacon. I like the way you cooked the kale. So much better than cooking greens for a long time. I agree. i prefer my greens cooked quickly and for a short time. Thank you Jovina. Hi Seana, I love Goodwill! I’ve scouted Goodwill stores in Portland since I got here. Now I have a problem with the luggage to take back home! Interesting because we hadn’t had kale in a long time too! mmmm. I really like raw kale too. Certainly is nice with bacon…that is for sure. just took the bacon from the freezer so we could make this tonight :-) Was thinking yesterday that I needed to find something fun to do with kale I’d bought at the farmers’ market (lacinato–I love, too) as I’m all kale chipped out. this is perfect! And if I REALLY had my act together, I’d make your yogurt cake. We’ll see… It’s gonna happen eventually. thanks for another fantastico recipe. Do tell me how much you love it because I know you will! Glad you have all the ingredients on hand. Thanks! I loved it :-) The bacon grease made all of the difference in the world. Though I couldn’t convince my kids it was yummy :-( Their palates just don’t do dark leafy green–yet! I can still make this vegetarian, right? Beautiful capture and super simple recipe :). Most definitely! I usually do cook it without meat, this was a first. So delicious! You would love the serving dish! :) I’m sure you have plenty a bit similar yourself. Would love to see your collection! Looks delicious. I love when you can tell what ingredients are in a dish at a glance. I feel like those are usually the lighter dishes, too. Kale and bacon! It must be fantastic. I’ll have bacon with anything, mind you… Lovely! Me too. I am seeing bacon in the most interesting foods lately! Of course bacon in chocolate bars, muffins, ice cream and popcorn (to name a few) has to be good too. Kale with bacon is too good. And you’re using the type I would love to try, if I could get my hands on it! Phah! Probably only available in London. Shoot. Maybe someday you’ll come across lacinato kale. In the meantime, I’m sure this would be just as good with any type kale, or leafy green for that matter. Truly was a delectable way to serve kale. Now if I had a slice of your blackberry challah right about now I would be in heaven! Lovely! Just-wilted kale is the perfect way to cook it, I agree. And everything tastes better with bacon. Wow, your young man certainly does have a mature palate. I’m hoping my little men grow up to have an appreciation for healthy/good food. I’d feel like such a good mummy serving this meal up to them. ah yes, the side dish lifestyle. great minds think alike. although i have to admit, it is easy to get carried away. i always start with a quick saute, and then end up with a table full of tiny dishes of delicious things. which of course is never a bad thing. i was wondering, how do you feel about nappa cabbage? i make a dish almost identical to this one, only with chopped nappa and a little sesame oil and red pepper flake instead of syrup and red wine vinegar. i’m definitely going to give yours a try, it looks like an excellent (decidedly more western) alternative. I love a table full of tiny dishes! My favorite. We call that a “feast” at our house. I couldn’t feel any better about the idea of nappa cabbage the way your are describing it. I love nappa cabbage and you just gave me a great idea. Where’d you go Misha? :) Nice to hear from you! Love this, will make it this weekend. I’ll report back. Absolutely delicious. Oh good! I hope you get a chance to make it, I’ll love to hear your feedback. It has been about a month that I have introduced kale to our diet. Loving it! I have been eating mainly raw. Love the taste of it! Oh good! I really enjoy it raw too. You feel so good when you eat it, right! I was surprised when I saw the recipe called for maple syrup, but then if your bacon get a little doused in your syrup at breakfast it is wonderful! I could eat this kale everyday. You will love it Lindy! I WILL love it! You are so right. But then I love everything you make! Love kale. I made a curry last week and added kale to the concoction. 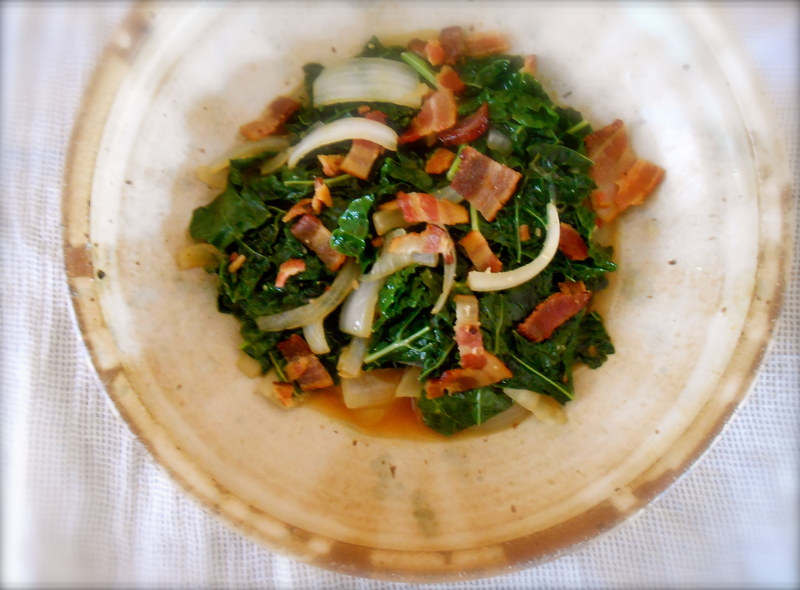 But kale as a main ingredient, like in this recipe sounds amazing and bacon, OMG! A combination that is hard to beat. I just bought bacon from the green market and would definately try this recipe. Oh good! You’ll love it. I mean, after all, everything is better with bacon. :) Thank you for your nice comment. I think I better make this again too now that I think about it. You are currently reading wilted kale at COTTAGE GROVE HOUSE.